One by one, Davante Adams continues to silence his critics. His sophomore slump behind him, Adams’ status has risen from potential preseason cut candidate to arguably the Green Bay Packers’ most reliable pass catcher. 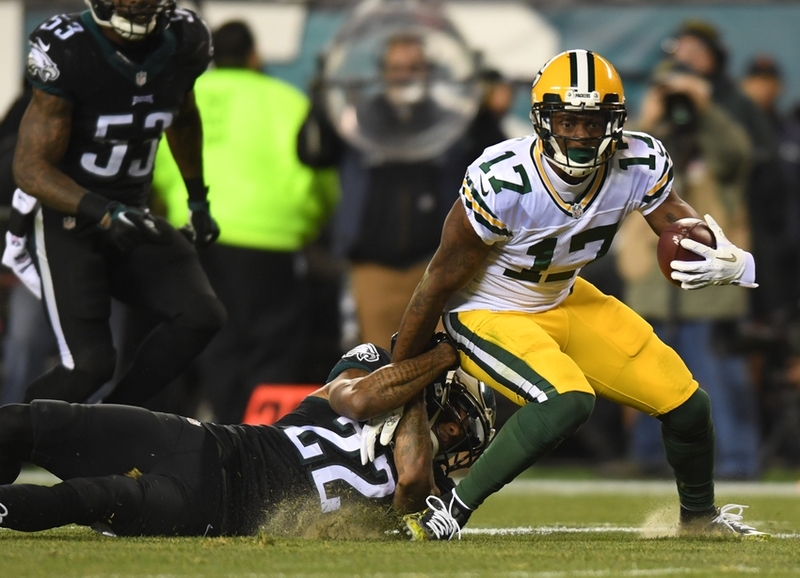 The third-year receiver has been quietly impressing all season, but Monday night was a breakout performance of national magnitude, Adams lighting up the Eagles secondary with five catches for 113 yards and two touchdowns. Finally healthy, Adams’ star is shining bright in a rejuvenated Packers offense. Week 7 proved to be a turning point for Green Bay’s aerial attack. Since, Adams has hauled in 43 passes for 558 yards, finding the end zone on five occasions. Savvy route-running, sure hands and yards-after-the-catch ability were all on display under Philly’s primetime lights. This is the Davante Adams the Packers expected after spending a second-round draft pick on him two springs ago. It was another draft pick spent at the wide receiver position that sparked speculation of Adams’ future. Following Trevor Davis‘ arrival in the fifth round of last April’s draft, many second guessed who might miss the cut. Adams’ future appeared cloudy. Fan favorite Jeff Janis was urged to see more of the field after two stunning Hail Mary grabs in last year’s playoff run, while Jared Abbrederis had earned the trust of Aaron Rodgers. It’s been the Davante Adams show ever since, however. Janis’ failure to flourish with limited opportunities puts his future with the team in doubt, the third-year man yet to translate his height, speed and athleticism combo into consistency on the field. Abbrederis’ injury history forced the Packers to move on from the former Wisconsin Badger, while rookie Trevor Davis continues to develop quietly. Through all of his struggles in 2015, Adams never lost the trust of his quarterback. Rodgers peppered his 6-foot-1 receiver with targets last year, a trend that has continued. Now we’re seeing Adams show the world what he’s been displaying to Rodgers and Mike McCarthy in practice. Jordy Nelson remains Rodgers’ go-to target, his security blanket. And despite his production this season, 2016 Nelson isn’t 2014 Nelson, which is hardly surprising give the fact he’s returning from a significant knee injury. Nelson’s time at the top is dwindling, the Packers in need of a young star to emerge. Adams’ path hasn’t been without its adversity, but he’s finally proving to be the potential the heir to Nelson’s throne.